“You ask (doctors) to break it down so you can understand what they are saying and they make you feel like there is something wrong with you,” said James, 67. Frustrated, the couple signed up two years ago for an experimental program at the University of Chicago Medicine. The James’ new primary care doctor explained Lawrence’s prostate cancer diagnosis and every procedure that followed until they understood each of them. “She speaks your language,” JoAnna James said. For example, when Lawrence James became too sick to leave the house, the program sent a doctor to the couple’s home. After he died in the spring, the couple’s doctor alerted specialists treating JoAnna James, in case her health deteriorated. The individualized model of care, called “person-centered care” or “patient-centered care,” is based on the concept that costs can be reined in by preventing expensive emergency room visits. It is beginning to take hold among those caring for the sickest and oldest patients. But by far, the fee-for-service model, where doctors are paid for the services they provide regardless of the outcome, is still the main system in the United States. One hurdle to overcome is getting people to buy into the concept. Its wonky name makes people think it’s just a gimmick to cut services, experts say. A poll of Americans age 40 and over conducted this year by The Associated Press-NORC Center for Public Affairs Research revealed some skepticism among those who have not tried this new kind of care. More than half of people receiving or providing care without a single health care manager, an aspect of person-centered care, didn’t think their care would improve much if they had one, while more than three quarters of those who had one said it improved things a lot. 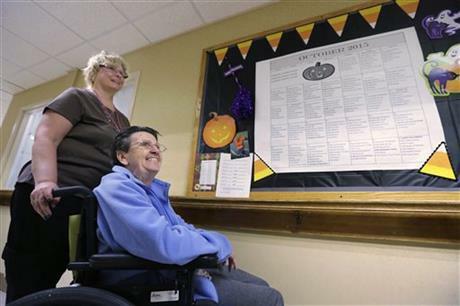 Lynda Crandall, executive director of Pioneer Network, a nonprofit promoting a culture change in nursing homes, said some nursing facilities have adopted person-centered care measures on paper, but in reality, the concept is not being put in place. They might have a document that notes a resident’s wish to shower at night, but the resident might only get to shower in the morning for lack of staff, she said. The renewed push for person-centered care comes as the U.S. population continues to age and the health care system is in a transition of sorts. To fully evolve, there should be financial incentives for those who embrace the new model of care, said Dr. Marshall Chin, a professor of medicine and health care ethics at the University of Chicago who focuses on health disparities. “The more that we say that patient-centered care is something we value and that it would be rewarded, the faster that it would happen,” he said. The federal government is beginning to align payment with this kind of care, but critics including the American Health Care Association say much more is needed. The association, which represents nursing facilities and other health care providers, points to proposed regulations that require additional training for staff on patient-centered care and on preventing hospitalizations and infections. The association says the proposed rules are asking for “too much, too soon and at too great cost,” and it wants federal regulators to slow down implementation, loosen definitions and revise cost estimates. “Good quality of care comes with a cost, period,” said John Vrba, chief executive of Burgess Square Health Care & Rehabilitation Centre in Westmont, Illinois. At the center, person-centered care takes different shapes. Some residents get a cup of coffee as soon as they wake up, while others sleep late into the morning. Sometimes, an administrator takes a resident on sporadic trips to downtown Chicago. Every month, a resident gets to decide how to decorate the activities’ calendar. Neal Glein, the facilities administrator, said the center runs a deficit of $36 per day for each of its 30 residents on Medicaid, or about one-quarter of its residents. On top of that, in Illinois payments are usually six months to nine months late, he said. And there is no reimbursement for activities, such as outings, that help with residents’ mental well-being. “That’s where the struggle comes in,” Glein said. ​This AP story was originally released on November 9, 2015. It is estimated that approximately one-half the world’s population receives news and information from The Associated Press each day, which suggests the reach and penetration of each of these stories.